Dave Splash Dot Com: Dave Gets Another High Profile Tweet! Dave Gets Another High Profile Tweet! So, the other day comedian Marc Maron responded to my tweet about a possible Maron O.D. That was awesome, and I got a few new followers from it. 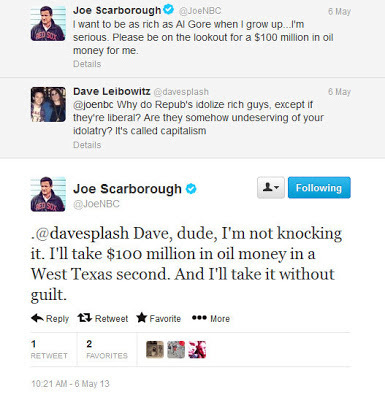 Then, a mere three days later, TV pundit and former Republican Congressman, Joe Scarborough ("Morning Joe" himself), responded to my question as to why Republicans only like rich people if they are conservative, and use wealth as a weapon against liberals. I'm not sure he really answered my question, but he was nice and humorous about it, so who cares really? But, holy crap did a lot of right-wing douchebags tweet at me! None of them had anything interesting or intelligent to say, and no one actually answered the initial question. They all just used it as a means to attack Pres. Obama about something he never said or did, but Fox News has convinced them otherwise. Pretty typical wingnuts. Maybe this twitter thing isn't such a waste of time. Who can I get to respond next?